These little 7oz bakery candles are really adorable. 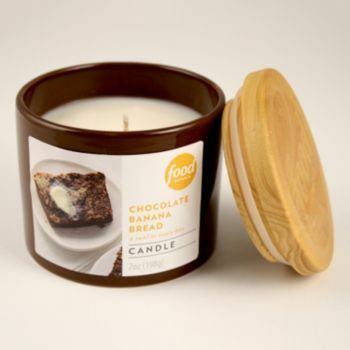 They’re little round brown cylinder jars with a loose wood lid that fits lightly on the candle with the Food Network logo embossed in the center. There are two labels on the candle that can be removed if you work at it but all in all, very cute candle. A bonus, you can recycle the jar when you’re finished burning the candle. They even give you instructions on one of the labels how to clean the jar when you’re done. Normal price for this candle is $19.99 but I would never pay that… Kohl’s usually has plenty of sales going where you can purchase it for half that and that’s what I did. You can also purchase this brand directly from Food Networks website but I recommend going to Kohl’s so you can smell it and catch a sale. I couldn’t find a scent description for this candle but boy did it smell incredible and very realistic. It smelled like sweet banana bread. I couldn’t really make out chocolate but I’m hoping that comes out once the candle is burning. The wax seriously smelled good enough to eat. A warm bakery banana bread that was very sweet. Mmmm!!! I’m drooling! I decided to test this candle in a smaller room to start out and ended up leaving it there from start to finish. The scent… almost non-existent, even after hours/days of burning and in a teeny room no less. Such a shame. If I put my nose directly above the candle, I could smell the warm banana scent but it was super faint. So disappointed with the strength of this candle considering the price. Strength on a scale of 1 to 10, I would rate this candle a 1. Ouch!! My candle burned fine. No wick issues, clean burning with no wasted wax. This review started out quite promising and ended in disappointment. The scent before lighting the wick smelled awesome… a warm chocolate banana scent. The strength however (once burning) was not so great. I don’t mind burning lightly scented candles but I at least expect a subtle scent throw. This candle produced nothing. I was so pretty disappointed. These candles aren’t cheap either… had I paid full price, I would have been upset. Oh well…… I have a few more fragrances to review from this brand (same style candle) so we’ll see how those perform. I hope better. This candle rated a little bit higher than expected because presentation was still decent and it burned perfectly. The scent was also authentic. The only ding it got was strength. Have you tried Chocolate Banana Bread from Food Network and did you have the same experience I did? Review it with us. In the comment section below, review and star rate your experience… it’s easy! Cold sniff, this candle smelled exactly like sweet and warm banana bread. Super yummy!! But the true test is how does it perform once burning?